Several of South Africa's endemic birds, such as Cape Rockjumper and Cape Sugarbird, are found among the more than 200 species in the Bontebok NP. Mammals include, of course, Bontebok, an antelope which once numbered just 17 in total (today there are around 3000) and Cape Zebra. It is the smallest NP in size in the country but nevertheless it has a rich diversity of fauna and flora. 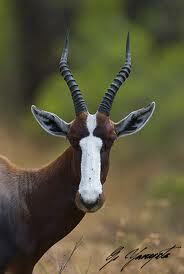 Bontebok lies in the SW of the country just 6km south of Swellendam at the foot of the Langeberg Mountains.